Welcome, everyone, to this week’s podcast. I’m happy to have you with us as we talk with Julie Liem from Eastside Church in Anaheim, California. As long as Julie had been at Eastside she always worked in a volunteer role, but a few years ago the position of Director of Volunteers was created and she was invited to step into it. It’s very common for the different ministries and teams at churches to all have their own way of doing things and no one to be communicating well with each other. Solving that issue is part of Julie’s job at Eastside Church, which has been around for 50 years. Julie’s with us today to discuss how she did that. Create a healthy culture. // One of Julie’s firm beliefs is that if you want to change your volunteer culture, you have to start with changing your staff culture. “It has to have a lot of vision that’s coming from the top, all the way from the executive leader down,” she says. A church needs a healthy volunteer culture in order to function well, and that isn’t something that can happen on its own. There needs to be structure and organization in all of it. To make that happen at Eastside, the executive team worked with Julie to set in place the vision for her role and what sort of DNA they wanted to be infusing into their volunteer teams in every department. Create standards. // Changing the staff culture at the top opened the door for Julie to introduce some new processes and procedures. She started out by creating the staff role of volunteer champ in each department. This individual is responsible for the onboarding of new volunteers as well as looking after the health of the volunteers in their department. Julie works with the volunteer champs to set the standards for what the volunteers process should should be. “The thing that made this so successful was that there was an identified staff person in each department to carry this out,” Julie said. That allowed her to have direct access between the executive staff and the volunteers within each department. Network with other churches. // Communicating with other churches is a vital part of building a healthy volunteer culture at your own church. Julie networked with other churches to see how they were doing things in order to get ideas. From there, she brought back their best practices and put together a plan that would work for Eastside. Create a centralized system. // With many different opportunities to serve at Eastside, it’s important to have a centralized system that takes all of it in and organizes it. As Director of Volunteers, Julie takes that information from one place and then sorts it out and distributes it to the correct departments. This includes processing new volunteers. If someone wants to volunteer, they’re directed to the department they’re interested in, the volunteer champ in that department is notified, and then a follow up is done. There are standards already in place for that follow up so everyone knows exactly what is expected. You can learn more about Eastside Church at their website www.eastside.com. 01:21 // Julie talks about her job role. 04:21 // Julie tells us why her job role was created. 06:42 // Julie talks about staff alignment. 08:35 // Julie talks about how she networked to find best practices. 09:30 // Julie talks about the system they created for signing up volunteers. 11:03 // Julie and Rich discuss the importance of tracing volunteer interest. 13:52 // Julie talks us through some of the processes when recruiting volunteers. 15:27 // Julie talks about some of the challenges she faced when trying to execute her directive. 17:03 // Julie and Rich discuss the importance of following up volunteers in a timely fashion. What does he do for fun // Family and friends. Adventuring and travelling. Eating in Southern California. Relaxing on the beach. Rich – Well hey everybody, welcome to the unSeminary podcast, my name’s Rich, the host here. I’m just so glad that you’ve tuned in today, I know here’s a lot going on at your church. This is one of those really busy weeks and I’m just thankful that you’ve taken some time out, plugged us in your earbud and today’s conversation is going to reward you for your time. Today we’ve got Julie Liem with us from Eastside Church, a fantastic church in Anaheim, California. Julie is the Director of Volunteers there. This church maybe familiar, we have had some folks on in the past from there. They have two locations, one in California, one in Minnesota I think is where the other location is right? Rich – Which is great. This is probably, summertime’s the time you want to be in Minnesota, you don’t want to go there in the wintertime. Rich – Currently pastored by Gene Apple, it’s a rather large church, about 5 thousand people. So Julie, welcome to the show today. Julie- Thanks Rich, I’m happy to be here. Rich – Yeah why don’t you tell us, give us the flavor of Eastside and tell us about your role there? Julie – Okay. Well, Eastside has been in existence for about 50 years, I have literally grown up there at that church and was involved in volunteer roles and leadership for years there. Our current Senior Pastor, Gene Apple came on staff about seven years ago and he and I went way back to when he interned at Eastside. In his college years he lived with my family and so it was just a great big homecoming when he came back, which was a lot of fun. Julie – But I was always in a volunteer role and in leadership in that capacity and when he came on staff, after he’d been there a couple of years and he really had changed the vision of Eastside and the direction that we were headed, he really centralized our focus and created our vision statement and our mission statement, so we knew what we were about, we weren’t about a hundred things, we were now about three things, to really mobilize it forward. About two years into his time with us, he and he executive team asked me to come on staff and added his role, Director of Volunteers to the staff. Rich – Okay, very cool. Julie – So that was new to me to come on church staff. I had always been in a volunteer role, so I think that’s part of maybe why they asked me, was because I know the life of a volunteer very well. Julie – So his is a new role to Eastside and at the time we were a very silo ministry, as far as there was no standardized practice as to how different departments went about recruiting volunteers, maintaining volunteers, onboarding volunteers, celebrating volunteers. Some departments were knocking it out of the park, some departments were really struggling. There was a whole lot of inconsistencies and they just knew that for our church to grow, that the DNA of our volunteer culture needed to be changed and enhanced and really solidified into something really electric, across campus, regardless of what department was happening. We knew that we needed volunteers to be able to grow and take us into this future to kind of carry out Gene’s vision for the church. So that’s why they prioritized the role. Rich – Absolutely. Well, I think it’s natural, it may not be good, well it’s probably not good, this kind of solo that can happen in ministry, by that I mean, kind of each department is doing its own thing. Rich – So you’ve got kids’ ministry, they’re pretty convinced that the way they’re doing it is right, because they have to run people through background checks and then the folks in groups’ ministry, they’re pretty fired up about the way they process volunteers, because they want to dig deep into people’s lives. Then the music guys don’t have any process. That’s normal right? I only say that because I can totally identify, I think so many churches are in that boat. So how did you go about trying to tackle that issue? Julie – You know, it has to have some structure and organization to it. So the executive team worked directly with me, at the very beginning when I was first onboarding and then we then worked with their staff. So our Senior Minister was working with our staff to just be able to cast this vision that this role was coming on, we were going to create some new standards, because we’re going to raise the bar about how we took care of volunteers and that it was going to rock in every department. Julie – And we were all going to be in unison with this thing and we really started working on changing our staff culture before we tried to influence our volunteer culture, which paved the way then for me to come in with some new processes and procedures. Julie – If I came in with new processes and procedures, but nobody was catching the vision, I’m just pushing that rock up a hill by myself. Julie – So that was just a huge blessing to me, that I was on boarded in that way, because I’ve worked with lots of other really large churches and they don’t even have this role. 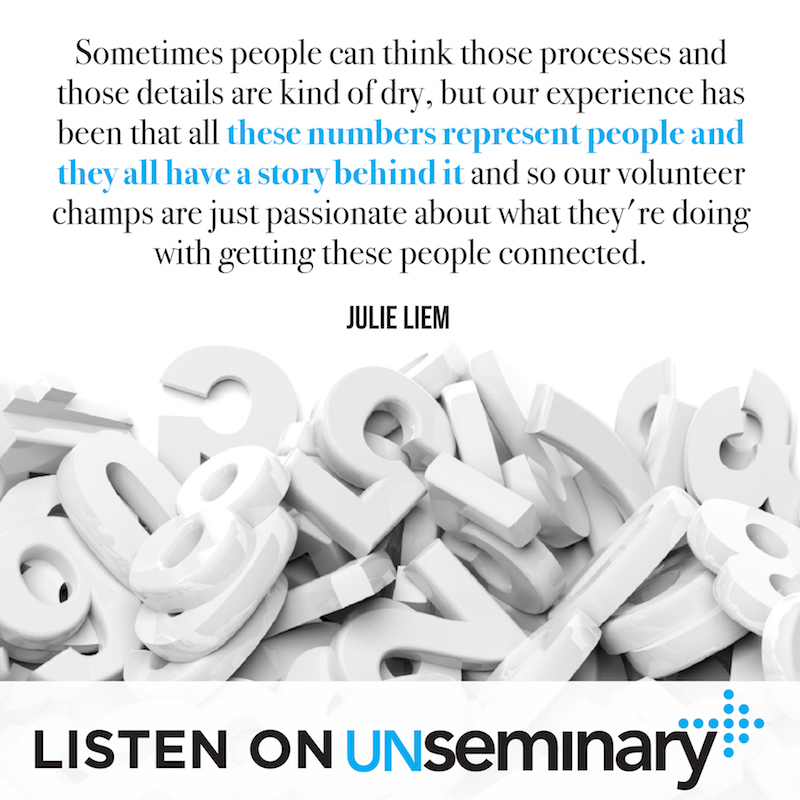 Julie – So they’re very much silo ministry, which ends up being, these departments are competing with each other for volunteers and the volunteers are growing fatigued hearing, “Come and serve in my department.” “No, come and serve in mine.” You know? Julie – And it just gets exhausting. Rich – Absolutely. Well the thing I appreciate, you’re obviously underlying a super important point, it’s got to start at the top, there has to be vision for it, which is a nice humble way to say that to try to deflect some of the good things that have happened there, but you must have done something to try to help that alignment. It’s one thing to have kind of the big vision. Rich – What were you doing to kind of help the alignment and actually move people towards that? Julie – Right, well one key thing that we did was we decided to identify a person in each department, a staff person in each department, that was responsible for the onboarding of volunteers. Julie – And the overall health of the volunteer culture within that department. So I created standards and each department that I worked with, we call that role a Volunteer Champ. So I can highlight for you, the big things that we had to get in place, the thing that made it most successful was there was an identified staff person in each department to carry it out and I have alignment with the executive staff. Rich – Right, in a big stick? Julie – And I had access to those Volunteer Champs. Julie – So it takes a lot of coordination because there’s really a dotted line from my role, from the directors and then my role, I have a dotted line to their staff. Julie – So I have to work in a lot of coordination with them so we’re not asking too much of that staff person at one time. Julie – But it’s worked beautifully, to be able to make sure that the standards are delivered and I can maintain inspection of those. Rich – What would you say your kind of orientation to those champions in those early phases, was it more like, “Hey, let’s collaborate together to find the best practices among our team and then we’re going to align those things,” or was it kind of, you’ve been charged to go and figure out what the best idea was and bring it back? Rich – How did you position yourself? Julie – Great question. It was the latter. Julie – It was me being charged by Gene, he resourced me with some other people in these roles at other churches to network with and bring back some of their best practices, but also the executive team member and I were all working together and coming up with our own ideas. So we worked together as a team, I did some research and networking with other churches and then came back with our best plan. Really they were probably three or four things that we did. Julie – We created a centralized system for volunteers, one place that they went to express, to sign up to volunteer. Rich – Yeah tell us about that. If I’m at Eastside today and I’m like, I’m sitting in your service, I’ve got to First Step with Gene, I am kind of interested in the church, how do I express interest, what does that look like? Julie – Sure. On a given weekend you can just walk up to our information desk and they’ll take you to our website and sign you up for whatever department that you’re interested in. So our website is one way to enter the portal. You walk up on the weekend to the information, they’re going to go to our website to enter you into our portal. If we ever have any recruitments that are happening on campus, all that information goes into the portal. So there might several different streams, but they all go to the same place. So we created one centralized way that we input the information into our system and then it gets distributed to the right departments. So you could come in this front door and say, everybody comes in the front door and then you tell us what room you want to go in. Julie – You want to go to Creative Arts, you want to go to Children’s, you want to go to Guest Services and then it goes directly there. From there then those Volunteer Champs in those departments get notified and they start their follow up and I’ve already trained them on what the follow up standards are. So that’s the second thing. We had to create a way for volunteers to get in but it didn’t matter where they came from, they all came into the same place. Then the second one was we had to create follow up standards for all the departments. How are we going to follow up? So I can drill down to that if you want, but that was just merely the next step. Rich – I’m sure every department follows up with everyone and every person gets placed in, obviously a little tongue in cheek. What happens if a volunteer falls through the cracks? How does your system deal with, “Hey, maybe this contact is going cold. It’s been a while since we talked to them,” how are you tracking those kinds of things? Julie – Right, well I inspect, with my team, everything that’s happening on a weekly basis. Julie – So that’s a big part of it. Rich – So you’re gathering with all of those Champions every week, or you’re looking at a report? Julie – I’m looking at a report and following up with them. Julie – Then we gather the Champions, sometimes monthly and I want to get back to that, where we aligning that a little bit more and sometimes it was weekly, depending on if we had new things that we were implementing and we’ve got to train ourselves and get the practices going and learn from each other. But weekly we’re running reports and monthly we’re running reports. So we’re inspecting what’s happening. So we have a really good tracking system that allows us to be able to do that and so then, at any point in time, know where every individual volunteer that’s coming into our system, what their status us. So we’ve made really clear our standards to our Volunteer Champs that we’re going to respond, we give them 48 hours, but it’s really 24 hours before that first response goes out. Julie – We make three attempts to contact a volunteer before we consider them unresponsive and we have just different things to do to be able to track it all. So that’s the beauty of it, it’s very sustainable but if you don’t inspect what you expect, forget it. Rich – Preach sister, come on, come one. No that’s great. I want to underline for our listeners. Listen to what we’re talking about here, managing the data about your people is the beginning of a pastoral care process. When your church grows you’ve got to manage that data very well and take care of it. When someone expresses, when someone raises their hand and says, “Hey, I’m interested,” if we don’t go out of our way to be proactive, to follow up within 24 to 48 hours, to jump on that and to say, “Hey, I’m going to close this issue,” that’s how people fall through cracks, that’s how a big church just feels like a big church, not a community. I appreciate that, that’s cool. Julie – Yeah and sometimes people can think those processes and those details are kind of dry, but our experience has been quite the opposite, that all these numbers represent people and they all have a story behind it and so our Volunteer Champs are just passionate about what they’re doing with getting these people connected. If there’s a glitch in the system, they’re reporting it to me before I even notice it and those kinds of things, because they know it matters. Rich – Yeah, absolutely. What database system are you using at the core? Julie – Church Community Builder. Rich – CCB, that’s great. They’re a great provider, they do a great job for sure. Rich – Alright, so that’s kind of on the frontend, that gives us a sense of what’s gone on there. Rich – What else are you doing to kind of ensure alignment across the board, to make sure that there’s common standards in the way that people serve? Julie – In the way people serve, so once they’re…? Rich – Their roles, do you have like job descriptions, that kind of stuff, what does that look like? Julie – Yes we absolutely do, yeah. We have job descriptions. We take the time to make sure that we’re evaluating our roles on a regular basis, at least on an annual basis and if anybody in any department, is going to be adding a volunteer role or feels the need for it, they’re going to have a conversation with me first, because there’s a whole lot of detailed things in our data process that have to be tagged. But mostly we’ve got to make sure that there’s a qualified leader for any new volunteer role and that’s a big part of what we’re looking at, because our model is, we want it to be a big church to be a small church and that happens with the right sized teams that are being led by our volunteer leaders. So one volunteer leader cannot adequately lead 300 people and have personal relationships and know where they are spiritually to be able to encourage them to a spiritual next step. So we’re constantly watching that to make sure we’ve got qualified leaders, that they meet our qualifications for a leader, because we look at them as spiritual leaders, not just tactical leaders and that they’re well trained and that then we’ve got everything in place so that they’re going to have a successful experience leading their team of volunteers. Rich – Alright, so I’m sure through this role, as you were trying to break down the silos and get some alignment, there was probably an area that took a little longer to kind of get onboard. How did you work with that? You don’t need to name any names, we don’t need to out anybody. Rich – But how did you kind of bring that department along, or bring those leaders along? What did you learn through that process? Julie – That’s a great question. I think it’s just consistency. I’m kind of like a bad penny, I just keep showing up. You know our friend Greg Curtis always says, “Julie, you are water and I am the Grand Canyon and you have just been wearing down a drip at a time.” Like I just kept coming back and tried to build relationship and lean into that and keep reiterating things. Julie – So, yeah that’s where I dig into my relational skills. Rich – Yeah, what you’re describing there, for folks who may not be familiar with what’s called the matrix organization, where you’ve got people where they really end up having two supervisors. You’ve got your, in this particular area they had their solid lines, as they’re sometimes referred to, but then you’ll have folks like Julie who are dotted line, that are kind of subject matter experts who are being charged by the organization to make a difference in this area across a wide variety of areas. I just think it’s been cool to kind of hear inside of that today. Is there anything else you want to share before we move on with the rest of our episode? Julie – Probably a couple of things that I think are really important besides getting your processes and procedures in line, as far as creating a way that volunteers can sign up and creating standards for follow up and tracking and evaluating your follow up, would be that how timely you follow up on volunteers is the number one impactor in growing your volunteer teams. Rich – Say that again, I want people to hear, lean in on this, this is important people. 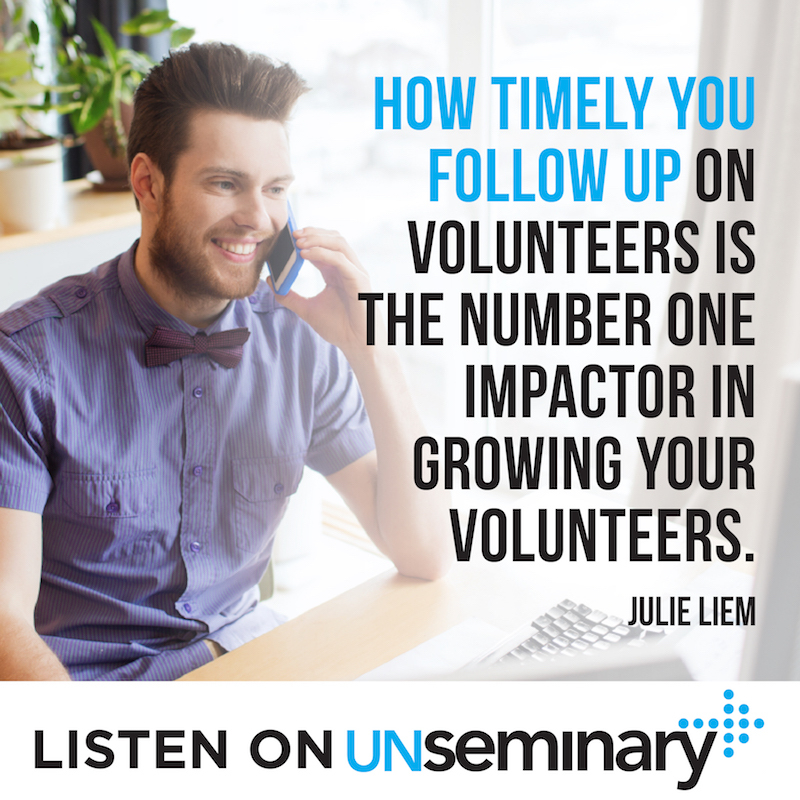 Julie – How timely you follow up with your volunteers is probably the number one variable that impacts growing your volunteer teams. Rich – So true. How have you seen that work out in your ministry? Julie – Well those leads just grow cold. Julie – If someone’s taken a step to be brave enough to step forward and say, “I’d like to join a team,” and then nobody responds to them, what are you going to feel from that? You’re going to feel like, “I got lost in this big huge church. They really say one thing but they mean another. They say they want you on their team but they really don’t want you on their team. I don’t matter.” All these kinds of things. Now that’s where it goes back to the vision. Our Executive Team knew, if we get a healthy volunteer culture going, we’re going to grow our church, it’s going to grow all the way down to the dollars in the tiding bucket. Julie – Because if they’re invested and they’re going to stay you’re more likely to give to what you’re invested to and it just grows exponentially because of that. So how quickly you make that first phone call is the make or break. Rich – Absolutely. We’ve talked about it internally at our church, that we picture these kinds of opportunity as we’ve just picked fruit off a tree and we put it at a basket at the bottom of the tree. That fruit, if we leave it at the bottom of the tree it will rot. Rich – Yeah it tastes very good the moment you pick it off the tree and there is a decay that happens over time. Rich – I like what you’re saying, responding in 24. Listen in you could respond within 12. Rich – If you could respond even faster than that, that’s a great thing to leave people with today, for sure.